Cool Balancer is designed for horses and ponies that need extra topline and condition and that are in light to medium work. Cool Balancer is a ‘Non-Heating,’ cereal-grain-free formula; with low levels of sugar and starch, plus good quality protein to promote topline. Cool Balancer provides a very palatable, safe and effective way to improve condition and topline without adding excess calories to the diet. Cool Balancer is an economical feed balancer for those horses that do not need a hoof supplement and are not working hard or showing or stressed. Feeding Cool Balancer improves the amount of nutrients that a horse can extract from his feed in very similar ways to Comprehensive Feed Balancer (p.8). Because the horse can extract more nutrients from forage the amount of concentrate that needs to be fed can be reduced. This benefits digestion and is a more natural way of feeding leading to a more relaxed horse. The forage to concentrate ratio is also improved because Cool Balancer is very nutrient-dense. It is fed in very small quantities, for example just 500g (approximately two TopSpec measures) a day for a typical 15.2hh middleweight weighing 500kg. A small amount of hard feed obviously leaves more space in the digestive system for forage than a large hard feed. Because it contains very low levels of sugar and starch and is fed in very low amounts, the chance of excess sugars and starch overflowing from the foregut to the hindgut and causing a microbial imbalance leading to acidic conditions, is virtually eliminated. Therefore the chances of a horse behaving badly due to ‘acid guts’ are minimised. Cool Balancer contains generous levels of B vitamins, some of which have long been considered helpful for their relaxing effect. It also contains helpful levels of anti-oxidants which can certainly help to neutralise the effects of stress in a horse and by so doing, may help him relax. Grazing plus ad-lib meadow hay or haylage. 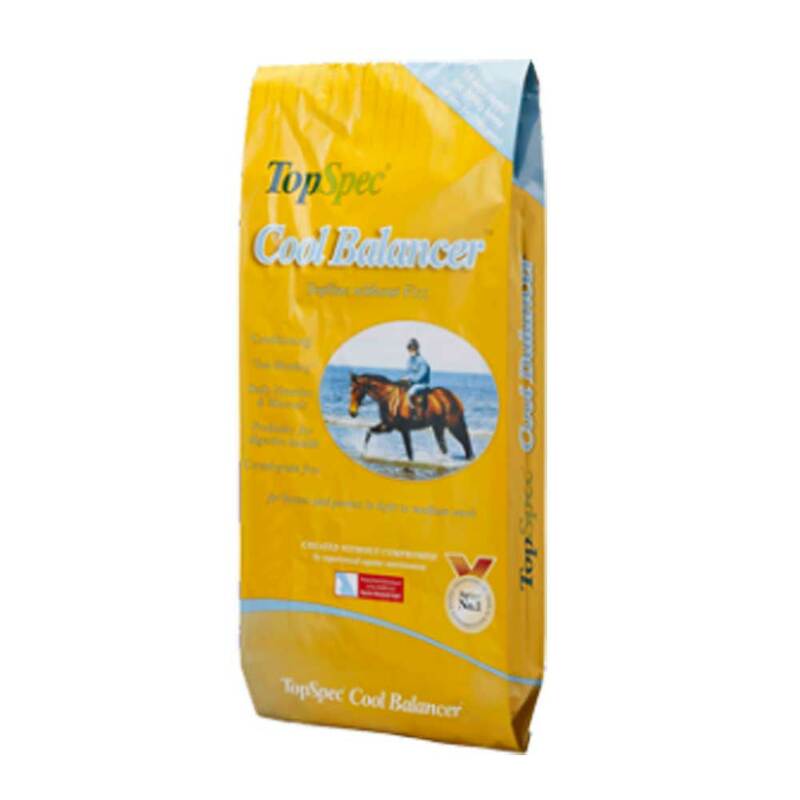 250g TopSpec Cool Balancer (for condition, muscle development, topline and general health). 300g TopChop Lite (‘Non-Heating’ unmolassed alfalfa/ straw chop). Up to 1.5kg TopSpec CoolCondition Cubes (‘Non-Heating’ conditioning cubes, quantity adjusted according to condition). Additives if required; Electrolytes, 10:10 Joint Support, Calmer or Digestive Aid. The typical ingredients in TopSpec Cool Balancer are soya bean meal (GM), wheatfeed, high fibre oat by-product, unmolassed beet pulp, linseed expeller, grass, vitamin and mineral premix, molasses, soya hulls (GM), soya oil (GM), yeast.